I go crazy when I hear that Vaun­da Michaux Nel­son has anoth­er book com­ing out. I’m a fan. For my own read­ing life, No Crys­tal Stair: a doc­u­men­tary nov­el of the life and work of Lewis Michaux, Harlem book­seller, is one of my top ten books in the last ten years. I found every aspect of that book sat­is­fy­ing. I learned a great deal. Ms. Nelson’s writ­ing style is well suit­ed to nar­ra­tive non­fic­tion: she makes it excit­ing. So, when I heard that a pic­ture book form of No Crys­tal Stair was on the hori­zon, my expec­ta­tions were high. It would be illus­trat­ed by R. Gre­go­ry Christie, whose work I have loved ever since his Stars in the Dark­ness (writ­ten by Bar­bara M. Joosse) found me sob­bing. But how would they com­press all of the great true sto­ries in No Crys­tal Stair into a pic­ture book? They’ve done it. 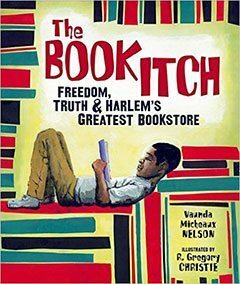 Even the title appeals to younger read­ers: The Book Itch: Free­dom, Truth & Harlem’s Great­est Book­store (Car­ol­rho­da, 2015). The book is nar­rat­ed by Michaux’s son, Lewis H. Michaux, Jr., who is just­ly proud of his father. It opens with Muham­mad Ali’s vis­it to the store. Jump right in! With the longer text in No Crys­tal Stair, Nel­son builds a depth of under­stand­ing for Michaux’s com­mit­ment to books. In The Book Itch, she knows this is not need­ed for young read­ers. We learn the parts that will inter­est this crowd. Michaux start­ed with five books, sell­ing his read­ing mate­ri­als out of a push­cart. He couldn’t get financ­ing from a bank because the banker said “Black peo­ple don’t read.” Michaux believed oth­er­wise. His store became a place to find, and read, books by and about black peo­ple. Lewis Michaux was a good friend to Mal­colm X. They were both polit­i­cal and believed “Nobody can give you free­dom. Nobody can give you equal­i­ty or jus­tice or any­thing. If you’re a man, you take it.” Nel­son includes the heart­break­ing scene that recounts Michaux’s reac­tion to the assas­si­na­tion of Mal­colm X. His son had nev­er seen his father cry before that day. This book keeps his­to­ry alive and vital by con­nect­ing us to The Nation­al Memo­r­i­al African Book­store, a place which was, in Michaux’s words, “The House of Com­mon Sense and Prop­er Pro­pa­gan­da.” Christie’s illus­tra­tions are at once a record and a rib­bon reach­ing from the past, show­ing us how peo­ple felt. We often for­get about this in our look back … and it’s essen­tial to remem­ber that impor­tant his­tor­i­cal fig­ures were just like us, think­ing, act­ing, laugh­ing, hurt­ing. Ms. Nelson’s place in my list of Best Non­fic­tion Authors is firm. This is a book that belongs in every library, class­room, and on fam­i­ly book­shelves. Books bring us free­dom.